Cadillac Fairview is embarking on two major shopping centre redevelopment projects: the restoration and expansion of 2 Queen St. W. in Toronto, part of the CF Toronto Eaton Centre complex; and the creation of a TD corporate office at CF Champlain in Dieppe, N.B., near Moncton. At CF Champlain, TD will take over a former Sears Canada location which closed in January. The redevelopment will result in a 109,000-square-foot, single-storey office building scheduled to open in January 2019. “We look at different options and end up choosing the best option for the property,” said Cadillac Fairview senior vice-president of development Brian Salpeter. 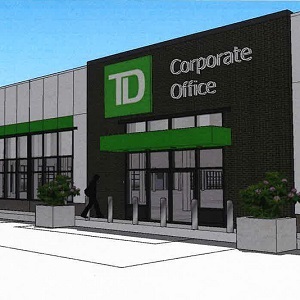 “In this particular case, it was a great opportunity for us to add the TD corporate offices. With CF Champlain’s 140 retailers and food vendors providing amenities, and good public transit access, Cadillac Fairview believes a modern office facility featuring an open-concept design and common areas is a great fit and worthy of the $25 million it’s investing in the project. “We want to work with today’s top employers to redefine what the traditional workplace is, and have these really innovative office spaces in these amenity-rich environments like CF Champlain,” said Salpeter. CF Champlain underwent a major redevelopment in 2014 and 2015 when Cadillac Fairview closed the Crystal Palace Amusement Park, Ramada Plaza Crystal Palace Hotel and Convention Centre and McGinnis Landing Restaurant to make room for a 110,000-square-foot Bass Pro Shops. In Toronto, CF says it will restore the original 1885 façade of 2 Queen St. W. and add three additional storeys to the heritage building. The redevelopment will add 23,150 square feet of office space and 22,011 square feet of retail and storage space. There will also be significant mechanical, structural and electrical upgrades. The design of the top floor will accommodate a restaurant with exterior terrace. “A beautifully restored 2 Queen Street West would serve as a gateway from Yonge Street to the south entrance of the CF Toronto Eaton Centre,” said Cadillac Fairview development vice-president Rory MacLeod in a statement. The 2 Queen St. W. building most recently housed a mix of retail and office space. Cadillac Fairview transformed four floors of a former Sears building at Vancouver’s CF Pacific Centre into a 280,000-square-foot office space for Sony Pictures Imageworks, Microsoft and Miller Thomson in 2015. It has 17-foot ceilings, two atriums and a landscaped roof. It was announced in March that a BMO urban campus would open in CF Toronto Eaton Centre’s former Sears office space. It will feature advanced digital technology, open floor plans, a variety of collaborative work areas and a dual two-storey atrium. “We see this as a model that can work at a number of different centres,” said Salpeter, who oversees development for Cadillac Fairview’s eastern region. Aside from CF Champlain, there are recently closed Sears Canada stores in four Cadillac Fairview shopping centres in Quebec that now represent redevelopment opportunities: CF Galeries D’Anjou in Montreal; CF Carrefour Laval in Laval; CF Promenades St-Bruno in Saint-Bruno–de-Montarville; and CF Fairview Pointe Claire in Pointe-Claire. “We’re quite advanced for our redevelopment plans for a couple of those Sears stores already,” said Salpeter. “Hopefully we’ll be in a position to make announcements in the near future. Cadillac Fairview is one of the largest owners, operators and developers of office, retail and mixed-use properties in North America. It has a $29-billion, 67-property Canadian portfolio as well as investments in retail, mixed-use and industrial real estate in Brazil, Colombia and Mexico. Cadillac Fairview is owned by the Ontario Teachers’ Pension Plan, a diversified global investor that administers the pensions of more than 300,000 active and retired teachers.